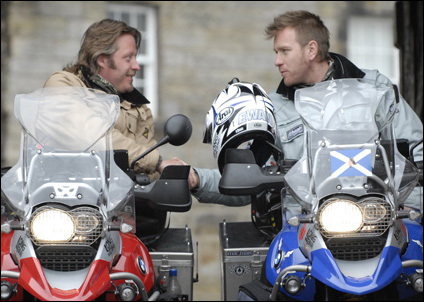 Earlier this fall, the Fox Reality Channel and the BBC aired Long Way Down, a series documenting actor Ewan McGregor and his friend Charley Boorman on a motorcycle trip from John O'Groats, Scotland to Cape Town, South Africa. Their route took them through mainland Europe to Italy, down the eastern coast of Africa, across to Namibia and finally through South Africa. 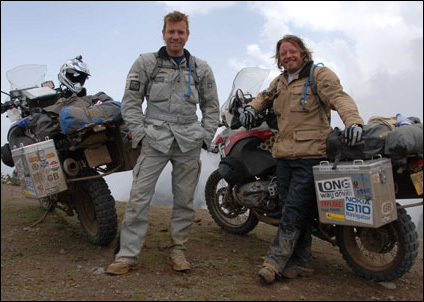 One purpose of the trip was to raise money for charities UNICEF and Children's Hospice Association Scotland, but the journey was also a sequel to the actors' previous excursion, Long Way Round, during which the pair traveled eastward around the world, from London to New York. McGregor is, obviously, the much more famous actor of the two, but Boorman is perhaps the bigger motorcycle aficionado. The son of director John Boorman, his film resume may be a bit limited, but he is no stranger to rugged terrain, having in the past participated in races like the Race to Dakar, during which he was injured and had to withdraw. As far reality series go, Long Way Down is rather enjoyable. McGregor is buoyant and kind of goofy, which is especially apparent in the first episode, which documents the several months of preparation work that goes into such an undertaking. There is an obvious bond between the two men, something that is mildly tested by the conditioning and travails that occur throughout the lead-up period. McGregor breaks his leg while riding through London, which almost completely derails the trip. Then, perhaps even more ominously, he decides that his wife, Eve, will join them for about ten days in Africa. Boorman is clearly not pleased with this prospect, which will taint the heterosexual male bonding that is plainly a very important part of the trip. Another hitch in the plans comes when Boorman is removed from an airport in London before their flight to Inverness because he throws a fit and uses the word "bomb" in the lounge. Hey, Charley, remember 9/11 and the massive increase in security? Even saying "bong" can get you in trouble nowadays. Though the entire 10-episode series is well assembled, the tension and drama that comes with the massive planning stage makes the first episode the strongest. As the journey actually begins, the editing gets choppier and faster-paced, as it must to fit a 15,000-mile journey into less than a dozen episodes. In addition to beautiful scenery, pounding rain, winding motorways, and setting up camp, viewers are treated to scenes of McGregor taking a shower (hot!) and Boorman lighting his farts on fire (not as hot). The shower scene and the numerous "confessional" scenes, a staple on every reality show, were shot on the actors' diary cameras, just one of the many sources documenting the trip. 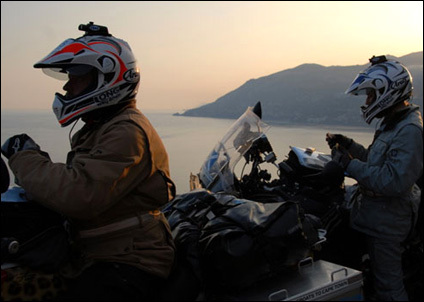 Boorman and McGregor are also both equipped with helmet cams, and they are tailed by two SUVs with producers, cameramen, and other members of their support team. But, overall, they are on their own, actually riding their bikes and facing the dangers and excitement that come with it. 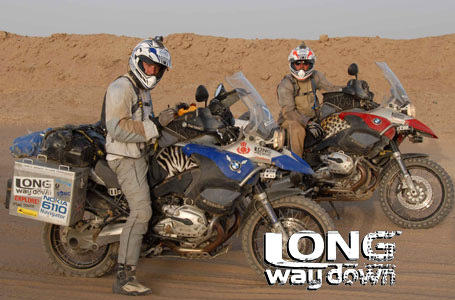 Three episodes in, Long Way Down captured my attention as a unique and interesting reality program in both its subject matter and the engaging personalities of Boorman and McGregor. For those viewers who can't get enough, the three-disc DVD set, released this month, is full of bonus features, including bonus and unseen footage and a documentary called The Missing Face, detailing McGregor and Boorman's first trip to Africa.